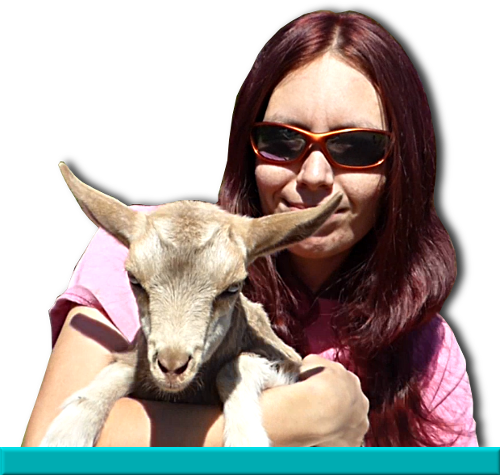 I think by now, everyone knows that my favorite part of goat keeping are the newborn kids, and I have made labor and delivery a specialty of mine. But it hasn’t been an easy road – just when I feel like I’m starting to get a handle on things, along comes a doe to teach me something new, or to give me an experience I won’t forget. Midori, a large heavy doe, decided to ensure my very first kidding season here at Honey Doe Farm and Creamery started out interesting. I was personally still reeling from the devastating loss of my pets and possessions in a house fire, and the stress of moving into a home and culture very different than my own, and so greatly looking forward to the more complicated yet far more simple birth of the kids. It was Lance who texted me that the first doe was in labor, and I hurried outside to attend, nervous and eager to prove myself half-way proficient at this extensive (and I had no idea how extensive it would become) job I had taken on. Midori was a first freshener, but already quite a large mature doe, and I felt assured there would be no issues. I checked the position of the kid with two fingers, and told Francine, who had joined us, that it was doing just fine. And indeed, it wasn’t long before a pretty little spotted buckling joined us. He also set off an alarm bell – he was tiny. I said nothing, thinking perhaps he was just small, as sometimes happened, and helped clean him off before setting him in front of Midori to lick and nuzzle. The next kid was too long coming, and I checked carefully, and what I found made me break out into a cold sweat. I had never felt what I felt inside that poor doe’s uterus, and as I glanced up at my two waiting employers, I could feel anxiety closing in like a thunderstorm. I turned my attention back to the doe, and that was enough to turn the storm aside – there was never more a place where I have felt more in my element than with a doe in labor. I went and washed my hands and arms carefully, then with the aid of a lubricant, I began to sort out the terrible tangled mess I had encountered just beyond the birthing canal. Unfortunately, as this story is straight from reality, this part does not have a happy ending. The second born kid I extracted was a tiny doeling that took two desperate breaths, but no more. We tried to revive her, using every technique each of us had learned, but she passed away and was set carefully on the hay. The third and fourth were dead as I pulled them free, the cords and bodies tangled together in a snare that took me many long careful minutes to sort out. I couldn’t believe there could possibly be more, but as I swept her uterus one more time, my fingers encountered a tiny hard bundle. As I gently guided it free, we found it was a long dead mummified kid, the first I had seen in person. We were greatly disheartened by the four dead kids in front of us, but one was still alive, and Midori needed to be cared for after such a stressful ordeal. We moved her and her tiny boy closer to the house where I could monitor them, and we got them settled in nice and warm. Thankfully, there is still a bright shining light to this story. Little “Han Solo” as I called him, though he was tiny and delicate, thrived under Midori’s care. We babied him and I carefully chose a home for him where he would become a breeding buck. It ended up being the right choice, as you can see for yourself what a magnificent animal he has become. Our little Han Solo has grown into a pure piece of artwork, and we’ll never forget the interesting and sad event of his birth. Adult picture courtesy of Whirlaway Farms.